After years of delays, evacuation orders issued, equipment prepared for demolition of illegal Bedouin outpost east of Jerusalem. Israeli law enforcement officials and security personnel are preparing to demolish an illegal Bedouin encampment east of Jerusalem, following years of delays and legal battles. Known as Khan al-Ahmar, the encampment of some 170-180 Palestinian Authority Bedouin was established in the 1990s with no authorization or building permits. 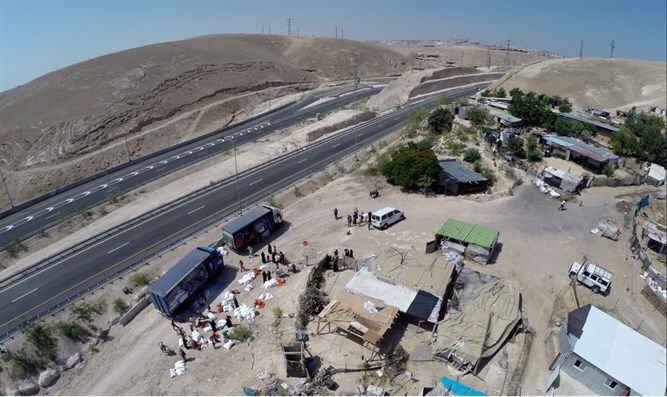 The outpost was built within the town limits of an existing Israeli community – Kfar Adumim – prompting Israeli law enforcement authorities to declare Khan al-Ahmar illegal, and call for its demolition. On Tuesday, however, it appeared that the government was preparing to remove the illegal Bedouin encampment. According to a report by AFP, residents and activists opposed to the demolition say that Israeli Defense Ministry officials delivered demolition notices to Khan al-Ahmar on Tuesday. In addition, residents claim that IDF equipment needed for the demolition, including at least one bulldozer, was positioned just outside the town in preparation for the evacuation. "Today they are proceeding with infrastructure work to facilitate the demolition and forcible transfer of residents," said Amit Gilutz, spokesman for the far-left B’Tselem organization. Earlier on Tuesday, the United Nations High Commissioner for Human Rights demanded Israel legalize the town, claiming that Israel lacked authority to enforce construction laws in Judea and Samaria.